Didn’t go to RollerCon this year? Or maybe you were there, and you couldn’t make it to Another Derby: The Seminar. Regrets? Fret not. Now everyone can get in on the best kept secret in roller derby: Roller derby itself. Find out the hows and whys of the game, from the pack, to the pivot, to power jams. 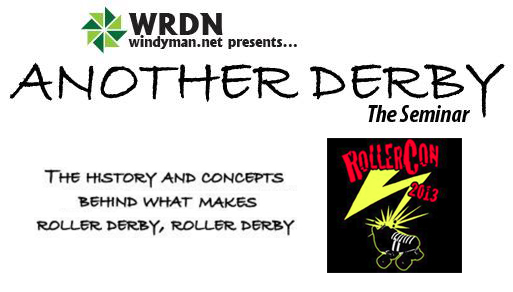 Discover what all roller derby rule sets, past and present, have in common. Then see how this knowledge can be applied to the modern game in a way that benefits everyone. (WFTDA, I’m looking at you!) Even if you know derby—or rather, if you think you know derby—get ready to love the game you love in another brand-new way. The 75-minute seminar has been enhanced with full diagrams and video overlays, so you’ll know exactly what’s happening through every concept and video as it’s happening. Thanks for watching, and thanks for spreading the knowledge. Knowledge is power!